Happy 20th Birthday to Nauticraft’s Escapade Pedal Boat! Nauticraft Corporation, a leader in manufacturing of pedal and electric boats, is excited to be celebrating the birthday of their premier Escapade Pedal Boat. 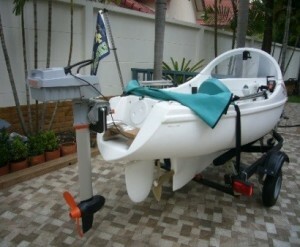 It was 1996 when Nauticraft first began building the rotomolded version (It had previously been built by Hoyt-Harken as the Mallard). Early 1980’s – Garry Hoyt, renowned yacht designer from Newport, Rhode Island, designed a pair of pedal boats. The first of these boats was the “Waterbug” of which the Harken Brothers (makers of yacht hardware) then built. And while the performance of the Waterbug was outstanding, there were some shortcomings to this boat (i.e. the small, tight cockpit made it unbearably warm in the summer, it was very heavy, it was expensive to manufacture). Hoyt addressed these shortcomings of the Waterbug by designing the “Mallard”. 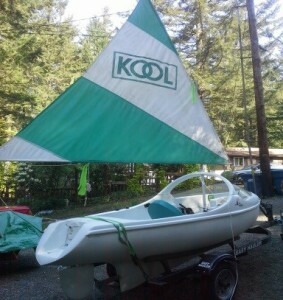 This was a larger and more open boat with a stunning avant-garde design, but the fiberglass process was still costly. 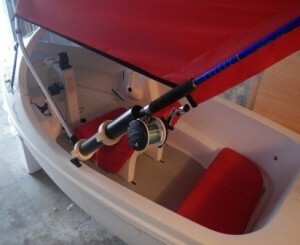 Unfortunately, both of these boats were ahead of their time and Harken pulled the boats out of production. 1994 – Curt Chambers, a custom injection molder from Michigan, became aware of the Waterbug-Mallard project and the tooling and inventory for the two boats, along with a license to build, was purchased by Chambers and transferred to Muskegon, Michigan. The Waterbug project was set aside and focus on making the Mallard more cost effective began. The drive unit was replaced by an entirely new one which was developed around the rotational molded housing. At that time the rotational molding manufacturing process for small boats was evolving, and it was determined that this could be viable for the Mallard. Molds and manufacturing equipment were contracted for and a new and simplified pedal drive system was developed. The Mallard name was then changed to “Escapade” to reflect this evolution. 1996 – The rotomolded Escapade goes into production. 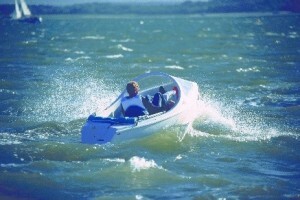 2002 – The Escapade Pedal boat earns a Guinness World Record for the fastest pedaled-powered English-channel crossing! 2005 – The low windshield Escapade is offered. 2016 – Nauticraft has molded and manufactured over 350 Escapade Pedal boats since their inception. We continue to receive rave reviews from happy boat owners. Pictures of the fun adaptations individuals have made to their Escapade can be seen at the end of this post. In regards to developments made to the Escapade over the years….it really is basically the same boat. The same mold is used & therefore the design is the same. The material is similar though in recent years black specs have been molded in with the white material – which in turn helps to hide dirt/smudges. And the windshield arch is now removable for a more open feeling.